When visiting Catalina Island, don’t forget to pack your sweet tooth. The Island has treats ranging from the classic caramel apple to ice cream with a unique adult twist. One thing is for sure, you will not be disappointed with your choice! Lloyd’s has been providing children and adults alike with a sugar buzz for over 75 years. 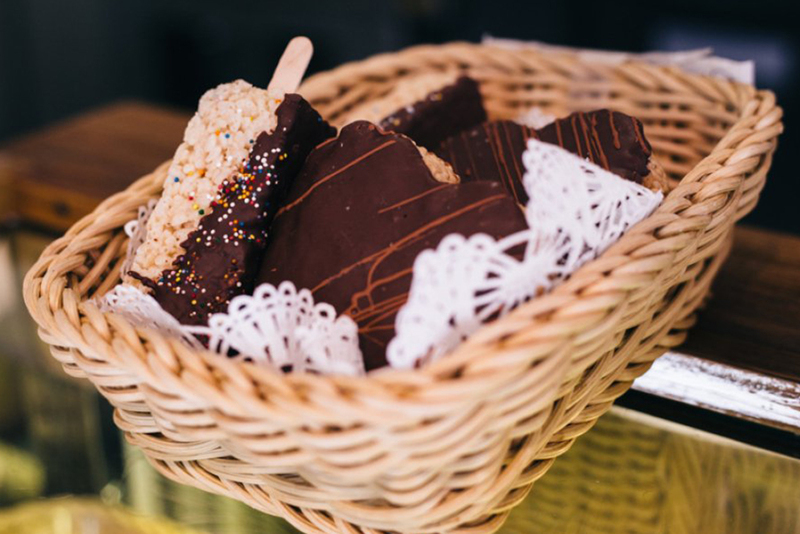 Known for their saltwater taffy and ice cream cones, they have all the treats that are perfect for a day at the beach. For me, I am a big fan of the caramel apples they make onsite. With numerous topping options, there is one for everyone in your group. The cashiers will also cut the apple into slices for you to share, if you feel so generous. When people see Scoops, many think of upscale ice cream and gelato, but that is because they have not tasted the mouthwatering crepes. The crepe with Nutella and bananas is mind-blowing and will make you want to come back again. While you may not think of crepes and island getaway as a pairing, Scoops will change your mind. Catalina Coffee & Cookie Company has a wide assortment of baked goods to compliment your morning cup of coffee. If you are looking to have a little extra snap in your day, try the Rice Krispy treat. Whether you prefer plain or covered in chocolate, this gooey goody will take you back to your childhood. We all scream for ice cream! It is hard to choose one place for ice cream as Catalina is lucky to have multiple spots for a scoop of this chilly treat. Descanso Fresh has all the classic flavors along with some with a twist. Those unique choices include their adult only flavors that are inspired by Catalina Island cocktails like the legendary Buffalo Milk and the Mexican Lollipop from Luau Larry’s. After tasting, you will be asking for a double scoop. If you have mixed feelings about flan, Coyote Joe’s version will turn you into a fan. The flan is very rich with a great consistency that will make you want to say no when the server offers two spoons. Who would want to share this tasty treat? Over 40 years ago, the Harbor Reef Restaurant in Two Harbors experimented with different cocktail concoctions in an attempt to develop a new visitor favorite. A local mixologist created the popular Buffalo Milk which was an instant success and is now served in almost every bar in Avalon. The Buffalo Milk is a dessert in a glass that packs a powerful punch with hints of kalua, chocolate and banana. Don’t worry no buffalo milk is actually in this drink. It is impossible to choose a favorite of this Catalina staple as bartenders try to put a slight twist on the classic recipe. One thing is for sure, you must try it before you jump on the boat back to the mainland because you won’t find it anywhere else.